A women’s magazine wants to publish several entries of John’s blog, but before they do they request that John edit some of the content to make it more enjoyable for the readers. Shocked to say the least, John tells them he’ll be in touch and returns to Baker Street where he runs into Sherlock lounging on the sofa with his laptop. Sherlock looks up and eyes him suspiciously. John nods, biting his lip and trying not to be awkward about it. John thought about it for a moment and nodded, nervous to hear Sherlock’s answer. Oh and to my few Sherlock friends, conjure_lass, madrona_8 and discedes. I'm willing to take request from you guys if you want anything in particular. This is sounds wickedly fun and while I can't guarantee John's approval of the situation, me and Sherlock will most definitely enjoy this. Awesome. That was great! I'll give you a request tomorrow when I think of something. One was going to be Chocolate...but someone did that...though they did not address what Sherlock is like ON chocolate. Can you imagine? 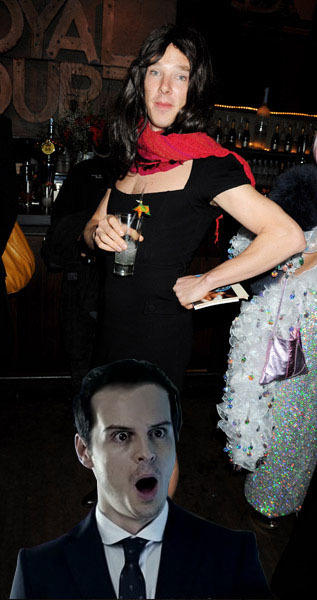 Second was **hides face** Sherlock cross dressing. And John finding it disturbingly attractive. Alright... *plots* On the chocolate one, I'm sure you mean like a 'sugar high', yeah? And the cross dressing, would you like it to be for a case or for them personally within their own flat? Yeah I was thinking sugar high. I imagine his endorphins would be quite wacky. It's all up to you though...I'm sounding an awful like a choosy beggar. I found that WAY amusing, and truth in real life. Up to you on whether or not yo uwant there to be bickering about John going on "BUT--BUT THE MONEY!" and John getting his meet-Mycroft-suit from The Great Game, for the evening. YES!! There absolutely HAS to be a fic for this!! !